Building a website is only part of the process as once your brand new website is working on the internet you now need people to visit it. Without developing an online strategy to promote your new website visitors may never find you and instead find your competition. On the internet over 1 new website is added to the internet every 2 seconds. With all these new websites on the internet to compete with your website you need to have your website stand out from the pack. So how do you stand out from all the other websites on the internet. In Australia 94% people use Google search as there search engine leaving vvery few users who use Bing or Yahoo search. For example the Number 10 spot on any Google search result receives more website visitors then the 1 one spot on Bing or Yahoo search. 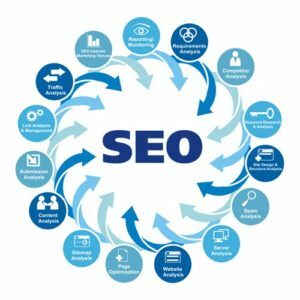 SEO is the name given to the process of improving your websites ranking on Google and other search engines. Google and other search engines use a range of methods to determine how high your website should rank. This is something which your local IT Specialist can help your business with. SEO offers benefits over Pay per Click advertising as you aren’t charged for each visitor to your website and just have the fixed monthly ongoing cost to maintain or improve your websites ranking. Search Engine Optimisation is an ongoing project of improving your ranking and can take many months to see your websites rank improve. If you would like to see an instant increase in visitors to your website and a way of tracking the visitor numbers so you can see a return on investment then pay per click advertising might be a suitable option for your business to promote your new website. Pay per click advertising allows your business to see near instant website traffic increases all while being able to control the price you pay for each click that is sent your your website. Is is generally a quick advertising campaign to setup and easy to maintain. Unlike SEO advertising you will find in most cases that Pay per Click advertising allows you to compete even with more established larger businesses that have very large marketing budgets. Social media is increasingly becoming a major role in how important your website and brand are on the internet. When talking about social media many people simply think of Facebook and how this can help but there is much more to social media marketing as a complete social media strategy should be developed for your business. The power of social media allows your business to communicate directly with your clients and they with you all in a easy and convenient manner 24 hours a day 7 days a week. It is important to remember that social media shouldn’t be used as a sales tool as it is about developing relationships and interacting with each other.